While in New York City, I wanted to try a new diner. As luck would have if, we ended up at two. The first we went too was the Cosmic Diner. One great aspect about the diner is that it’s open 24-7. Surprisingly, many diners are not! Image via Cosmic Diner website. For a tiny diner, it has everything a diner needs. There are plenty of booths, tables and a small bar located in the back. Even though it was a small diner, you had space and weren’t sitting on top of anyone. The coffee was brewed hot and fresh and I have no complaints. Despite not being terribly busy, our waitress wasn’t present too much. It wasn’t the best service but she was never rude to us. We could have definitely used more beverage refills. The Cosmic Diner has all of the regular diner staples. There is plenty of breakfast, lunch and dinner options but nothing unique or that sticks out. 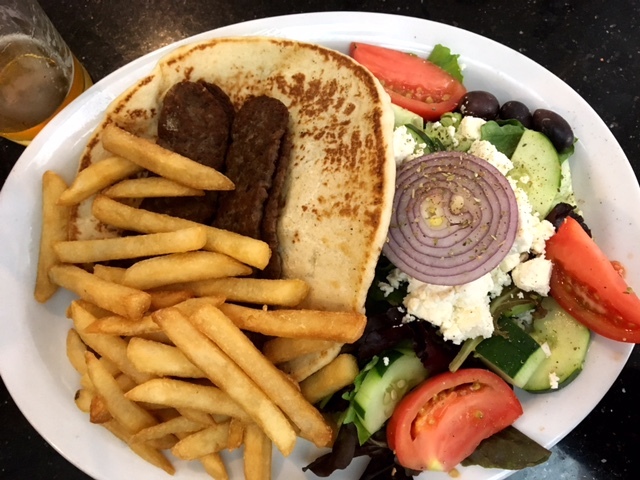 I decided to stick with a tried and true diner staple: the gyro. When it came I noticed, there was a huge mound of salad and minimal French fries. Normally it’s quite the opposite. I asked for Greek dressing and the waitress said she had no idea was Greek dressing was. The gyro itself was good. There wasn’t anything too special about it. The French fries were the same story. I appreciated the amount of salad though. For my gyro and coffee, the cost was $18. The value of the food was a turnoff. That is extremely pricey. The value is not there. It wasn’t a terrible stop but I probably won’t be back. As mentioned, the value of the food was a turnoff. There are plenty of unique and fun restaurants close-by or cheaper restaurants with better quality food. Was a bad meal? No. Was it a life changing, amazing meal? No. New York City locals: what is your favorite diner? I stopped by the cosmic diner a few times when I lived in NYC! It was a little pricy, but everything in Manhattan is! My fave diner was in Williamsburg, Brooklyn- the Kelloggs Diner. They were reasonably priced and had EVERYTHING! I’ll have to check that one out too Kerri! Thanks for stopping by!